We are interested in how individuals and groups might work towards a more unlimited application of knowledge and thus enhance their level of creativity in education, work and the rest of their life. We have developed three concepts based on these four principles. The concepts attempts to enhance an unlimited application of knowledge. The concepts are, respectively, The Creative Platform (used for teaching and development process), 3D Didactic (exercises for direct affecting body, mind and attitude) as well as The Embodied Training Program for New Thinking (training of creative behavior and thinking in shortterm and longterm perspective). You can read more about the concepts in the menu on the right. In our research we attempt to develop materials and tools according to the open source principles. The hope is to make it as easy as possible for any practitioner to start applying our concepts in practice. Therefore under each concept you will find a wide range of materials and tools that can be downloaded and used freely. You can also find a list of publications under the "Research group" menu. It has not been possible to make all our publications open source. In the list you find information on publishers and journals. Our research methodology takes point of departure in action and experimental research. We are therefore often involved in the planning, implementation, reflection and identification of learning in the projects we do research on. You can read more about our research method under the "Research Group" menu. 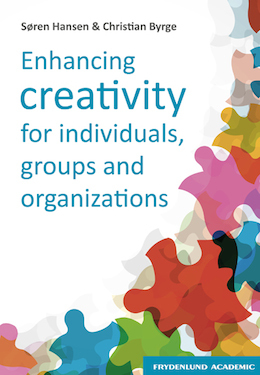 Enhancing creativity for individuals, groups and organizations is a new book that presents the four working principles of no-experienced judgement, task focus, parallel thinking and horizontal thinking as a route towards unlimited application of knowledge. It presents the concepts and practices of The Creative Platform, Embodied Training Program for New Thinking (creativity) and the 3D Didactic. You can find the book by following this link.